Hello everyone!! If you are blog hopping today, you should be arriving from Donna's Blog. Welcome to your next stop on the Kickin' Off Christmas Blog Hop. If for any reason you get lost on the blog hop, all of the blogs are listed in order at the blog hop facebook page by clicking here. iCopic is so glad to be a part of the Kickin' Off Christmas Blog Hop and really hope that you will check out our Design Team Call that was posted yesterday (Click here!). iCopic is the #1 internet retailer of Copic markers and has a great variety of stamping products also. We will be announcing our very own design team January 1st and we hope that you will check back regularly to see what we have to offer you. Here is a lovely project made by our design team leader, Samantha. She is also the owner of SP and Company and is your last stop on the blog hop. 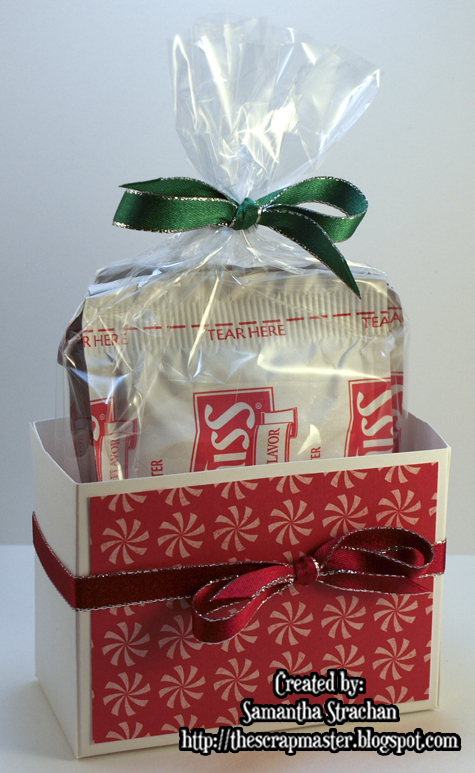 This adorable card and cocoa gift box would be a great gift for co-workers or children's teachers. It is just a little happy gift! The dog on the card is from the SP & Company - Christmas Emma Stamp Set. 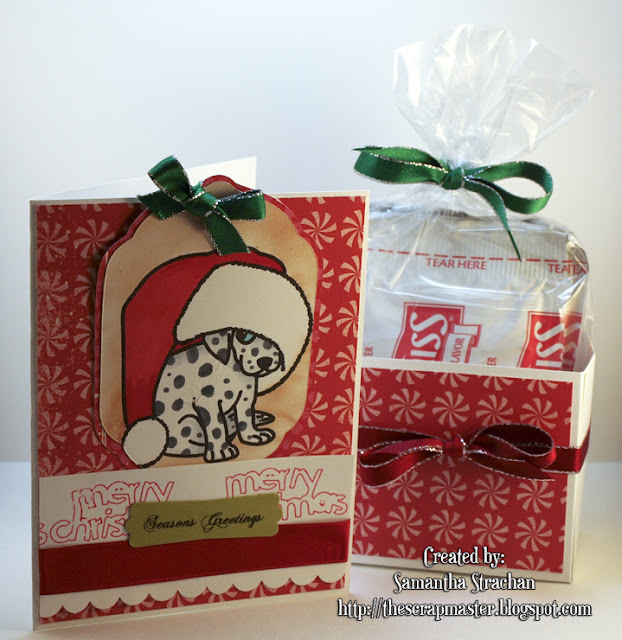 The sentiment is from the SP & Company - Ultimate Sentiments I Stamp Set. 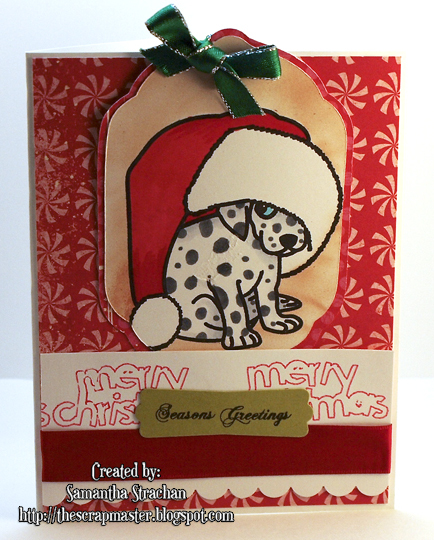 And the Merry Christmas pattern was made using the Chomas Creations Gel Pen holder and the Cricut Expression. The shape drawn is from the Cricut Simply Sweet cartridge. The directions for this goody bag will be available this weekend from Samantha. The template she designed holds 4 packs of hot cocoa mix perfectly in a cello bag. I hope you enjoyed our project for you! To show our appreciation for you stopping by, we have a special giveaway!! One lucky blog hopper will receive a little Copic Marker variety pack! In order to be eligible for the prize, please become a follower here and leave a comment below! This giveaway will end on Wednesday at midnight EST. (the ones shown below are not necessarily the colors in the prize pack, it is just a sampling of Copics.). Thank you for stopping by! The next stop on your hop is Maria's blog. Fabulous idea. This would be perfect for some co-workers. Love the little puppy. So cute. what a great idea!! And I love the darling puppy, too cute! I love this card. Thanks for sharing and I would love to win the markers (so far, I don't have any.) Thanks for the chance and I am a new follower. The cocoa gift box is adorable - thanks for sharing! Love the dog. Too Cute!! Thanks for sharing. I am so glad to be hopping today because I found your site. I love what I see everyone doing w/ Copics & am trying to learn as much as I can watching You Tube videos. Your Tuesday tips are great and thank you especially for the post on what colors to get started with. So Sweet!! Love handmadegifts!! Thank you so much for sharing. Great Job. Love this puppy!!! What a clever little holder and the puppy is so cute! I love this card and gift, it is super cute!! Thanks for the ideas and inspiration, I love using my Copic markers. The problem I have is that my little one (21 months old) loves to steal them!! Cute puppy! Thanks for sharing. I'd love to win some copics! Love your creation. Cute and great idea for a gift.. Thanks for a chance to win all these great prizes!! Mans best friend and a cup of hot chocolate, what could be better, great idea. Just precious! Your giveaway makes me drool! What a great prize!!! I havve owned copics for about a year now and just started using them 5-6 month's ago. Love them, love learning how to blend. On a mission to buy more pens. I just love the dog on your card, how cute. I love the cocoa box! This is such a cute set! I am already a follower. I love your blog! dont have any copics yet but crossing my fingers. lol thanks for the inspiration. thanks so very much for the wonderful ideas!!! And las but not least---the giveaway----what a blessing! If that little puppy were any cuter, I'd scream, LOL. Thanks for the inspiration! Absolutely adorable! I'm loving these ideas of hot cocoa packets presented in such a cute little package. I LOVE this idea! I am definitely borrowing it for some of those "what to get?" gifts this holiday season! And you have to love that adorable little puppy!! Thanks for the great giveaway! aww!! how sweet Emma is! Hi Samantha! What a cute project and I just love the sheepish look of the dog! My daughter loves gourmet hot cocoa, so I will definately be making this project for the holidays. Thanks for sharing. I am now following you blog. The little puppy is so cute. My little puppy loves cuddleing up under blankets and even crawls into pillowcases to sleep. This card made me think of him. Just became a follower. The puppy is so adorable! Love the card and box! Really who doesn't love hot cocoa..great project..
OMGOSH..he is so cute, love the colors you choose, very nicely done, thanks for sharing with us! This is wonderful, I love the hot cocoa holder and the papers you chose were great! The cocoa box and cards are adorable. Thanks for sharing. I am a follower now, and I love your little puppy in the extra large santa hat! So cute! Great project! Perfect for having on hand this holiday season. The puppy is just so adorable! Thank you for sharing! That dalmatian puppy is too cute! This would be great to give to my kids teachers! What a cute idea. If I worked, I would make them for the office. Okay, maybe I will make one for myself. LOL Im a follower. Such a cute lil doggy!! Adorable treat box...love the candy paper! I also love the idea of the copic give away. As I am just started getting my own copics, and can say I am the proud owner of 6 copic markers.. YAA HOO. Great card and box!! The puppy is toooo cute!! What a fabulous creation. This is one awesome crafty idea and the dog is super adorable! Me, I am just learning how to use copic's but I love them already! Glad you are part of the blog hop. Love what is on here. THanks. Very cute. I have heard so much about copic markers but have not taken the plunge yet. This blog prize would be great for me to get started. Hellooooo Markers!!! This is a great idea for giving away cocoa!! Plus the little dog is charming. Thanks for being part of the blog hop! That dog is adorable!!! My boys saw it and asked if I could make one for them!! I have been hearing so much about Copic markers and airbrushing. I would love to try them out so this prize package would be amazing! I like this card, I really like this idea as a little treat for co workers. Thanks for the chance to win copic markers. what an adorable puppy, I love this card. Such a cute and inexpensive idea for a gift! Love the puppy! cute project! i love the hot cocoa box you made & that pup is too cute! thanks for the chance to win.& getting me in the holiday spirit. What a creative project! Thank you for the inspiration! Oh that puppy is so adorable! Thanks for showing us your card and box project! Simply beautiful! Love the coco holder and the card, the puppy is too cute! I am a new follower and cant wait to see more amazing projects. Awww... what an adorable stamp image to the card. Love the colors and PP you chose for your Project. Great Work! Super cute! What a great idea for co-workers. I love COPICs -- my favorite! Love the puppy - so very cute and wonderful card. Thanks for sharing. I did become a follower. I'll be back! I really like the cocoa gift box idea and that dalmatian is so cute! This is very cute. Thanks for sharing. What a SWEET SWEET Card and Box ...LOVE it! Love your projects and your puppy is too cute! I just want to take him home with me! Love the projects. This is putting me in the Christmas mood. Cute card and cocoa holder. I love the SP & co stamps that I own. 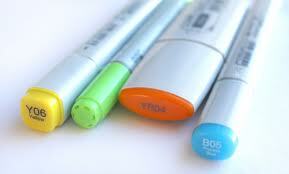 I am relly interested in using Copics an just havn't taken the plunge as yet. Thanks for the chance to win and try them out. Such a cute little gift idea. It would be great for a teacher or co-worker. I have never used copics, maybe I'll be lucky enough to get some. Thanks for sharing. Can you say "Cute"??????? Well this project can!!!!!! Thanks for the inspiration. The doggie is absolutely adorable. Would love to get some markers to help me start off my copic collection!!!! Thanks for the chance. Awe, the puppy is so cute peeking out from under the santa hat! Samantha is so talented. I really love love love her work. I've heard so much about copic pens but haven't bought any yet. Thanks for the chance to win a set of copic pens. These are gorgeous.... wonderful work Samantha! I've not been able to try Copics, but I can't wait until I can! Great entry. That little doggie is so cute. Aww, how cute is this? Great idea.. Your card and treat holder are so cute. Fantastic project! Thanks for sharing your talents and for the opportunity to win. I just love that little dog! how cute. That puppy is beyond adorable. I always love to see what people can do with these markers. thanks for sharing with us. Very cute. Love the idea for teachers and others you want to say thanks too but can't give much too. Super cute set! Thanks so much for sharing! Darling card - I love Sami's stamps and I love Copics! Love, love, love the puppy! I love Copics but my husband does not...ha ha! Adorable gift holder and card! Love the card and gift holder; very cute. Lovely set! Love that puppy, just adorable! How adorable! Love the puppy but not as much as I LOVE my Copics!!! That puppy is so stinkin' cute! I'm really enjoying this blog hop! Great color combo. Thanks for sharing. Love the cute dog in the photo! SO Adorable!!! Just too cute!!! That's a really cute gift package, love it! Love your projects and ohh, the giveaway of markers! Santa, I've been so good. Oooh! That Christmas doggie is just the cutest! Love his Santa hat! So cute! Thanks for sharing your creative spirit. I love copics! You can do so many cool things with them. TFS you great project! An iCopic.com FIRST!! Design Team Call!